Topic/Blog Idea for the week of April 5: Choose a city in a country other than your own, and tell us why you’d like to visit it. I would have bet the house on a mountain top, or the depths of the ocean, or the mysterious depths of a forest filled with little animals and beautiful insects. I really didn’t know what to expect, but I figured if he did have a favorite spot on Earth, it would be someplace incredible. That night, I dreamed I was walking through an alley. The street was very narrow and cobble-stoned, and the houses were tall and close together. I walked to the end of the street, which terminated abruptly in a pier and a waterfront. The water went on forever with nothing on the horizon line, and the sky was brilliant blue. The houses at the end of the street were stone, one white stone and one brown stone. I turned to leave the alley, and as I did, a young woman stopped me, handed me a camera, and asked me to take a picture, so I took a picture down the alley and looking out at the endless water. From there I went out to a “main street” and got into a car, and the driver took us out over a low bridge that just barely skimmed the surface of the water. In the morning, I realized, I’d “seen” the angel’s favorite place in my dream, but I had no idea where it was. There hadn’t been any street signs or any other overt hints that would cue me in. No language, no real sense of where it was… except that toward the end of the dream, there had been a lot of random visual images with a hard C sound. I was confused, to say the least. “What happened there?” I asked him, and for a moment I felt as if I heard in my heart, “You did,” but the thing is, I know I never “happened” anywhere like that. I’ve lived a pretty boring life, and none of the images from the dream resonated with me. I couldn’t remember anything like that, so I assumed I hadn’t heard that (well, it’s never clear when you do hear something) and poked around online. I thought maybe the hard C sounds meant “Calcutta,” and although it looked kind of right, it didn’t really feel that way. The area definitely had an “old” feel to it, a sense of centuries that are missing from American life. And to be honest, an angel has all human history to draw from. It was entirely possible the place didn’t exist any longer. I filed it away as “I’ll never know” and left it at that. But especially check out this one: narrow street, terminates in the water’s edge… It’s practically perfect. I could only stare at the images I was finding. And the thing is, I’m a “honeymoon baby.” I really did happen there. And at first I felt bad, like I’d “wasted” his favorite place on Earth, but then I realized how sweet that really is, because with everything and everywhere and everywhen to choose from, he had picked someplace he associated with me. Therefore, if I got the chance to go to any city on Earth, I’d like to go to Cadaques in Spain, to “happen” there one more time and see this place that an angel thought was worth sharing with me once in a dream. 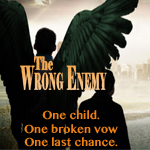 This entry was posted in angels, family, weblog tour. Bookmark the permalink. What a wonderful story. Just lovely. What a beautiful story! I just stopped over from your link on Conversion Diary, and I’m so glad I did; I will be thinking about this for years, I’m sure. SO beautiful. Came over via a link from Conversion Diary. This is an incredible story and one that also confirmed for me the proof that our very souls and life do begin at conception. Funny, I was just wondering that again today; does the soul come in at the very start or does it wait for the heart to beat? You just answered my question. Thanks to you and your angel. I had a strong feeling I was pregnant at 10 days post ovulation with my first and with my second. With Kiddo#4, I woke up in the morning at 10 days post ovulation and felt my guardian very excited. I said, “Really?” because for some reason I hadn’t thought we would conceive that cycle. That night I tested, and it was positive. So I think the guardian arrives at about 10 days post-ovulation, which is a good indicator that the soul is there by then as well. Wisdom and financial stability: those things tend to come when we’re thoughtful and measured about what we do. I don’t think angels really have much to do with financial stability, except that you might feel that hesitancy when you’re about to spend too much on something you don’t really need. Wisdom comes when it comes; it’s a gift from the Holy Spirit, and an angel can’t give that. So of all that, the finances are the easiest thing to handle, and the financial stability/freedom is what comes when you know exactly what’s coming in, what’s going out, what you want to do with your money over the long term, and how your short term actions will affect that. Just as an example: when we wanted to buy our first house, my Patient Husband and I sat down and figured we needed to cut down on unnecessary expenses. I put myself on an “allowance” so I wouldn’t spend money on impulse. Every month I had a certain amount for impulse buys, and I could spend that and no more. My husband began packing a lunch to bring to work, and making coffee at home rather than buying it at work. (My job provided free coffee.) Just changing those attitudes helped so much: suddenly we had the mentality that we were saving toward something we really wanted; it’s nice to buy coffee at work, but it would be nicer to have a house. And yeah, we only saved maybe $3 a day on coffee, $7 a day on lunch, heaven knows how much per month on my impulse buys — but it worked. Figure out what you want to do with your money *next year. * Figure it out for ten years from now. WHat’s most important to you: a new computer? A house? A new car every three years? Because if you’re asking this question at all, you can’t do it all. And more money doesn’t necessarily equal financial freedom. People with six-figure incomes can be just as trapped by debt as people earning at the poverty level if they make crappy decisions and don’t curb their impulses. Someone might need to drive a beater car (ten years and counting!) in order to get a new computer; or use a seven-year-old desktop rather than the brand-new MacBook Pro. These are all trade-offs, but you’ll be free enough to make those choices, and that’s what financial freedom is: you have the freedom to choose where you spend your money. Start with David Ramsey and read his work. http://www.daveramsey.com/ Then come up with your goals, and once you have goals, you will be able to achieve them. Good luck!